The Curriculum Stocktake Report recommends five sets of skills.  making meaning from information. Learn the importance of three types of literacy: text literacy, numeracy and visual literacy and how new technologies might help strengthen student thinking. Explore the possibilities of Engaged Learning with technology. How do students learn to recognize the difference? Module One - Visual Literacy - Go to the lesson. Module Two - Numerical Literacy - Go to the lesson. Module Three - Text Literacy - Go to the lesson. This model has evolved from structured lessons that take 2-5 hours to build to a model that requires only 10-15 minutes. 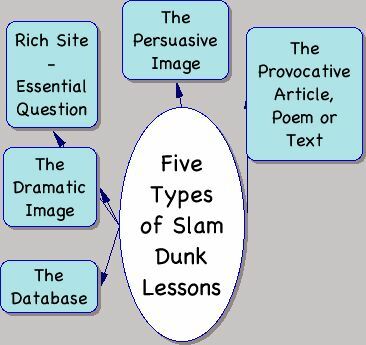 This new approach is called the "NoTime Slam Dunk Lesson." The first two links below show the original model. The third link will take you to the NoTime lessons.